Our School Spirit® paracord is authentic commerical paracord made in the USA. When reliability is a must, this is what you want. 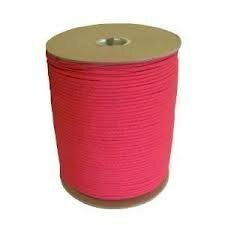 Paracord can be utilized in many great survival uses & the 7 strands can be easily removed Some uses for this cord can be: Ridgelines for Tarps Securing Equipment Shoelaces, Hanging Food from Bears, Vehicle Tie Downs, Sewing Fabric, Repairing Equipment, Making a Fire Bow, Fishing Line, Paracord String for a Bow, Making a Shelter, Fish Gill Nets, Fishing Line, Animal Snares Clothes Lines, Paracord Lanyards, Anchor Line, Binding, Twine, Animal Restraints, Tooth Floss, Splints, Tourniquet, Paracord Braiding, Bracelets, Paracord Bracelets & Other Paracord Crafts. If you have any questions about this product by OSS - Our School Spirit, contact us by completing and submitting the form below. If you are looking for a specif part number, please include it with your message.